YOOSUN Sport Travel Water Bottle!! What A Deal!! ★Enter Code YREKFQFZ or 2MCVK5TE. You Can Get Free Polarized Sunglasses When You Purchase 1 or more Water Bottle. 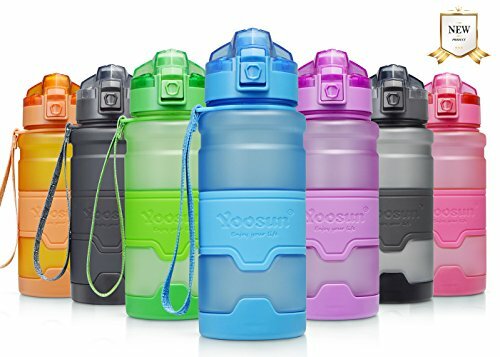 100%BPA-FREE WATER BOTTLES：YOOSUN water bottles are always 100%BPA-free . Constructed of durable, lightweight and food grade approved. Professionally protects the health of you and your family. ★NO LEAKING AND ANGLED SPOUT : The secure rubber of bottle cap , make sure lockout and no leaking . Angled spout provides an ergonomic drink interface that delivers a high flow of water without sloshing or spilling. ★HEATPROOF ANS NON-SLIP DESIGN :The unique silicone design in the middle of bottle can effective heat proof and non-slip, so that you can hold the bottle directly.Withstands temperatures between -10 and 120 ℃. So don't worry out of shape. ★EASY TO DRINK AND CARRY : Open the bottle with just one-click, slide your hand into the side strap and start drinking! lockout on cap ensures leak-free transport.Removable carrying strap offers extra convenience, you can take it anywhere. ★SCOPE OF APPLICATION :Each bottle With Volume marks more suitable for Camping, cycling, running, Travelling, Hiking, Gym or any space needed for service. it is a gift for your family healthy ,if you want, you will never miss the better bottle.